Schizophrenia affects 1 in 10 people but their experience of the condition may not be the same. Schizophrenia comes with a range of different symptoms and although there are risk factors which may make an individual more vulnerable when it comes to developing the condition, there is no definitive cause known. Symptoms of schizophrenia are often referred to as being either positive or negative; positive symptoms include any form of changes to the individual’s behaviour or thoughts, including hallucinations and delusions. If a person experiences a hallucination, this means that they hear or see things that are not really there whereas delusions come in the form of having strong beliefs about something which other people do not share… this could be having a strong belief that people are watching you or that someone is out to get you, despite there not being any evidence to support this. Negative symptoms are when the individual become withdrawn from society or when they are not functioning well when it comes to day-to-day life. These are not usually things that you would expect to see from a healthy human being. People who suffer from schizophrenia often appear emotionless. 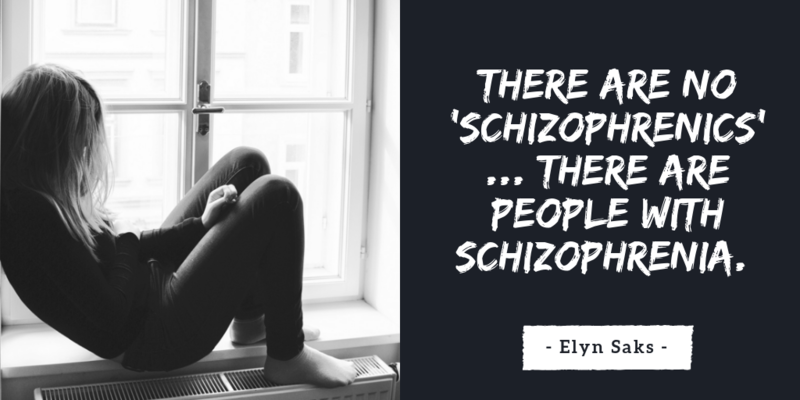 As mentioned earlier, there is no sole cause of schizophrenia, but there are some potential risk factors which could contribute to the development of the condition. Schizophrenia often runs in families, suggesting that genetics may be a factor. Although it is believed that there is no specific gene which causes the condition, studies have found that people are much more likely to be diagnosed with schizophrenia if a parent or sibling also has it. In identical twins; if one person develops schizophrenia there is a 1 in 2 chance that the other will also develop it…even if the twins are raised separately. In non-identical twins; if one person develops schizophrenia, the other has a 1 in 7 chance of also developing it. However in the general population 1 in 10 people are diagnosed with the condition, meaning that genetics are not the only contributing factor. Some studies suggest that people who develop schizophrenia are more likely to have experienced complications before or during their birth, such as being born with a low birth weight, being born prematurely or experiencing a lack of oxygen during their birth. These are the kind of things which would have an impact on the way a person’s brain develops… suggesting that brain development plays a part when it comes to being diagnosed with schizophrenia. Drug or alcohol abuse can also increase a persons chance of developing schizophrenia or other similar conditions. Certain drugs such as cannabis, cocaine, LSD or amphetamines are possible triggers. Using amphetamines and/or cocaine can lead to psychosis. Teenagers under the age of 15 who smoke weed regularly (especially ‘skunk’ and other more potent forms of the drug) are 4 times more likely to develop schizophrenia by the age of 26. There is a range of treatments available, including antipsychotic medications, which help with feelings of anxiety after a couple of hours, as well as reducing symptoms such as hallucinations and delusions after several days or weeks. There are also a variety of different therapies available such as Cognitive Behavioural Therapy, which looks at the individuals negative thought patterns and gets them to talk about the things that they find triggering to them, this way the therapist can help the individual to come up with better coping mechanisms and help them to become more independent. There are also family therapies available, not only helping the individual with schizophrenia but also helping family and friends to better understand the condition and teach them various ways of coping and approaching certain situations. Another popular therapy for people with schizophrenia is art therapy. This enables the individual to express themselves through arts and crafts as well as offering a fun and creative activity for them to regularly engage in. People with schizophrenia are often provided with a Community Mental Health Team (CMHT). This is a team of professionals such as mental health nurses, social workers, pharmacists, psychologists, psychiatrists and so on, who work together to come up with the best possible care plan for that individual. If you feel as though you are suffering from schizophrenia, please go to see your GP as soon as possible!